Welcome to Claremorris, milliseconds from New York, Frankfurt and Hong Kong! We provide 250Mb 'fibre to the building' for Corporates, SMEs and App Developers, and fibre-enabled business suites at Innovation House in our thriving town centre. We have 110kV and 38kV electricity, natural gas, and global air links at Ireland West Airport Knock. Our biggest employers - CBE Software and DeCare Dental - sell software and services at home and abroad through our high-speed 'fibre' broadband network. Watch our Invest Claremorris Video and check the business supports for Start-Ups and SMEs in the Digital Hub of the West! 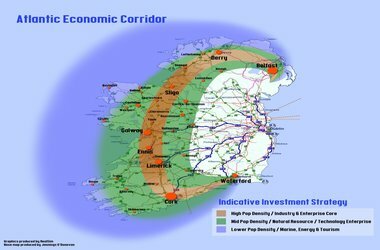 Western Rail Corridor on course for over 420,000 journeys this year.